Whatever your knitting or crocheting project preference, there can't be many people who haven't heard of the Norwegian design duo, Arne and Carlos. From flowers to slippers, socks to jumpers, Easter bunnies to Christmas balls and plenty of other projects in between, they bring a Scandinavian flavour to practical and decorative knitted and crocheted items that make them all uniquely attractive. 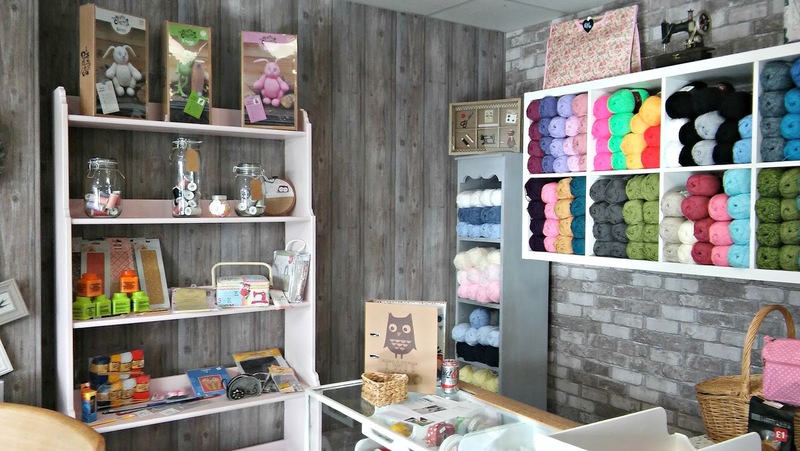 As I've mentioned before, I'm very drawn to the knitting of that part of the world so you can imagine my delight when Sara, the Marketing Director at Black Sheep Wools (the best local yarn shop a girl can have! J) asked if I'd like to go along to the workshop that Arne and Carlos were running. To say that I snatched her hand off is a bit of an understatement! 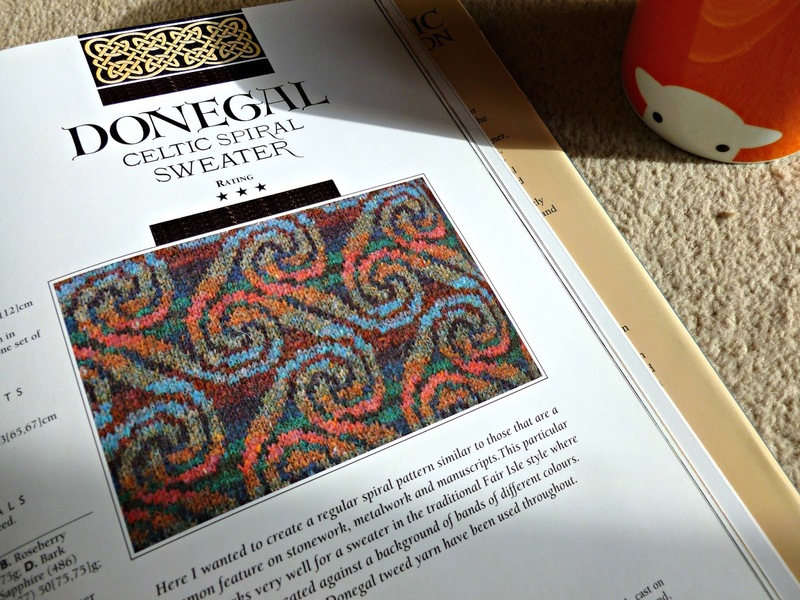 I haven't done any colour work for a long time so the thought of re-visiting an old skill with the added benefit of advice from people who knit in a different way to me was very appealing. 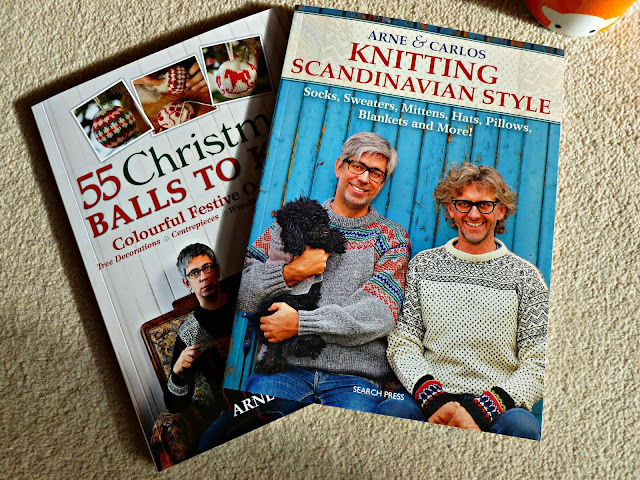 My yarn-in-the-left-hand knitting style is still far from perfect so the opportunity to watch first-hand how Arne and Carlos knit in the Norwegian style was just what I needed! Here I am with them – and if you’re thinking that it doesn’t look much like Black Sheep Wools and perhaps a little more like, say, a restaurant, then you’re right. 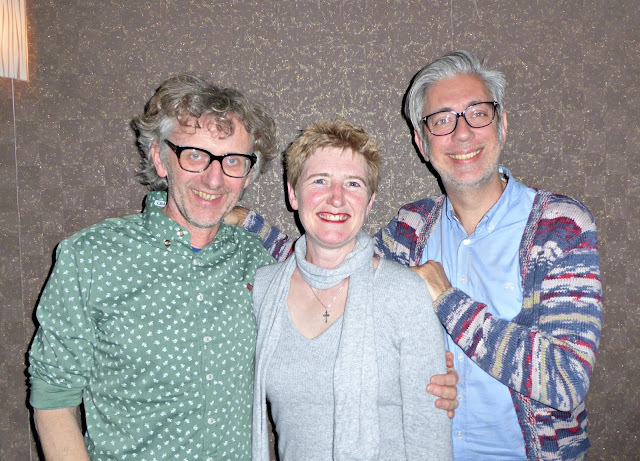 Oh my – not only was I invited to the workshop but also out to dinner with Arne, Carlos and Sara from Black Sheep the night before (here we all are). How exciting is that! I felt like quite the superstar myself! And more than a little nervous before I met them, but I needn’t have worried. Arne (pronounced Ar-nuh) and Carlos are engaging company and it's very easy to forget that you’re in the presence of people whose books have been translated into 17 languages and who appear on TV shows with millions of viewers – so easy in fact, that it wasn’t long before I had my socks on the table to show off my matching stripes (and no, my feet weren’t in them, that would have been very rude!). Luckily, they say that they always enjoy seeing the projects that people make otherwise it could have been a very awkward moment! We talked about superstar moments, about Britain leaving the EU, visiting Peru (they've been a lot and of course big daughter is going there in just a few short months), knitting in schools, the way that adults shape a child’s life by unthinking or unkind comments, traffic jams, how much they enjoy seeing people’s projects, socks (of course) and favourite heels (Arne's is the Russia or after-thought heel and he's a toe-up knitter) and a dozen other topics ... you can see how I ended up feeling comfortable enough to show off my socks! and the Craft Barn was filled with Arne and Carlos goodies - copies of their books and more balls of Arne and Carlos yarn than you could shake a stick at. I resisted sweeping it all up and bundling into the back of my car - just! I wonder if it's strange coming face to face with a life-size image of yourself? The workshop room was all ready and Arne and Carlos made some last-minute preparations whilst the workshop delegates gathered in the Craft Barn. 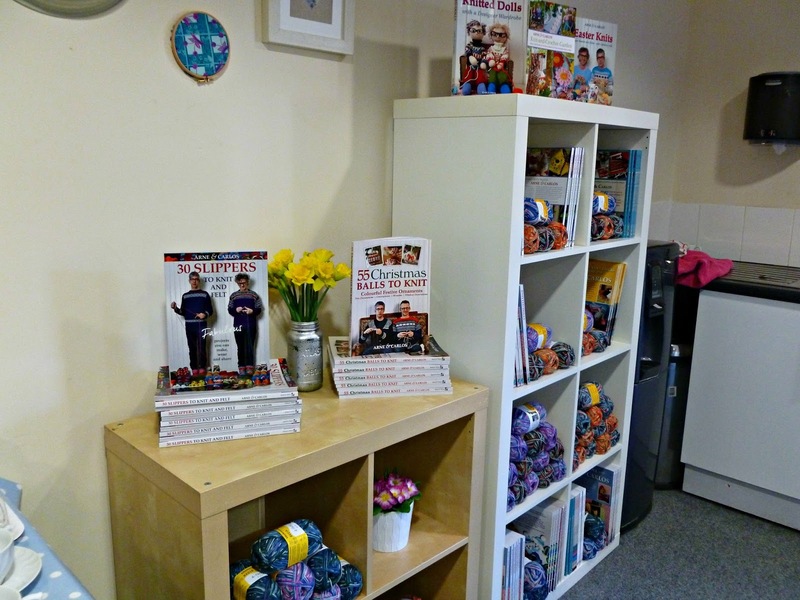 Then we were in the room and the workshop had begun! 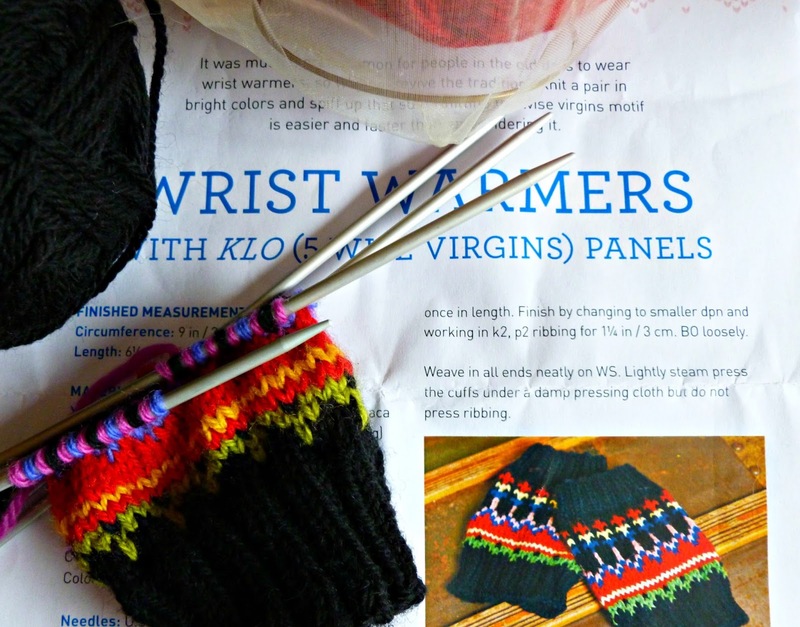 Arne and Carlos talked about the project that we were going to be creating, the wrist warmers pattern from their book Knitting Scandinavian Style. Thanks to the variations of language, the translated title doesn't explain that the patterns in the book all come from the Setesdal region of Norway where Arne's Grandmother came from. 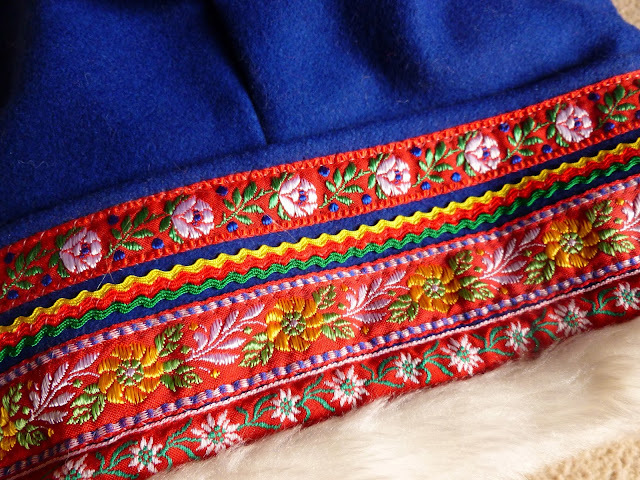 Originally, the folk costumes would have been embroidered and each region would have its own embroidery style that could be recognised right down to the embroiderer. 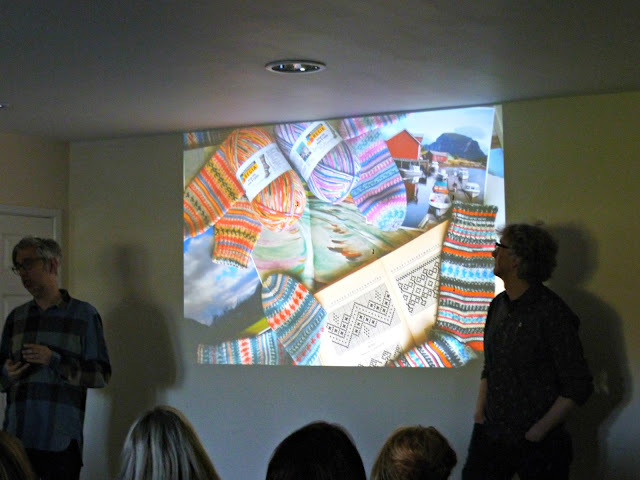 Today, with the advent of machine embroidery, those skills are disappearing and Arne and Carlos are on a mission to keep the patterns of the region in popular tradition by incorporating them in knitted designs. The format of the workshop was that everyone worked to their own pace and Arne and Carlos took turns to sit at each table to answer questions and demonstrate aspects of knitting with more than one colour. 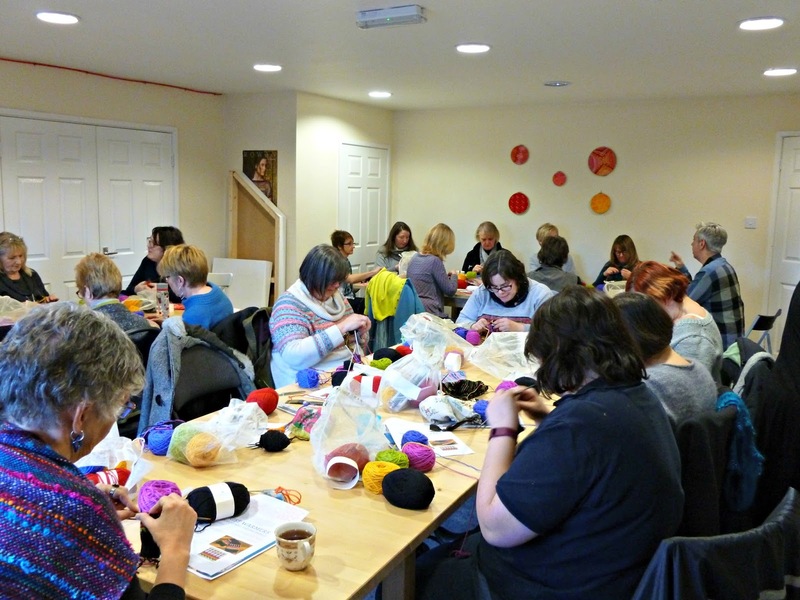 It worked very well, just like a sociable knit n natter. 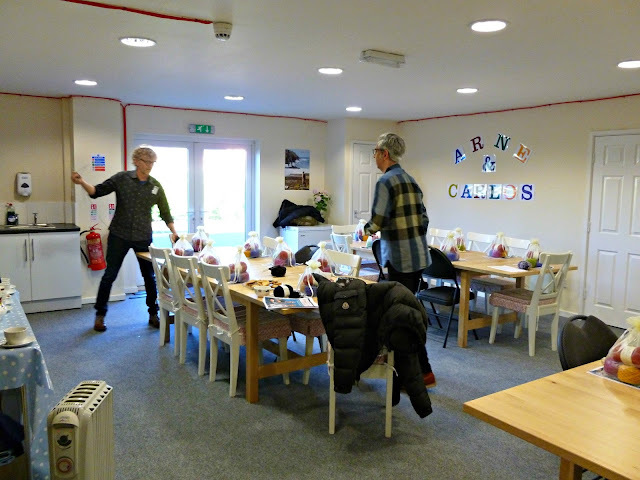 We talked more about Peru, TV programmes (Carlos loves The Bridge and has assured me that I am unlikely to have nightmares watching it - I'm such a softy sometimes! ), socks (what? you're surprised by that? I am starting to think that I have something of an obsession!) 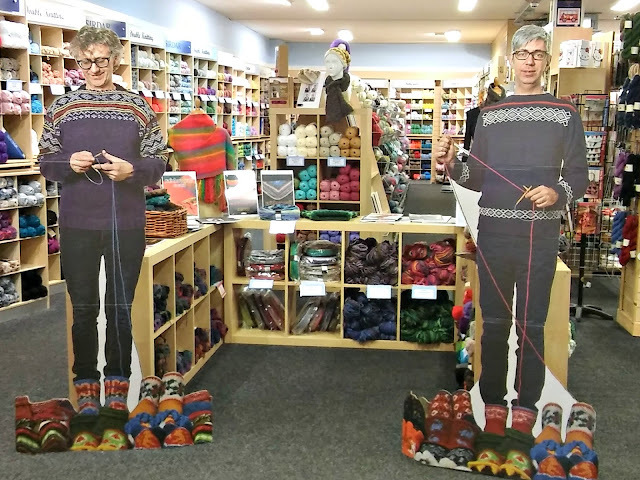 and at one point I once again shamelessly threw my socks on the table at the workshop, but only to show what the colours looked like knitted up J.
Arne appears to be at his most comfortable with knitting in his hands, and boy is he fast! 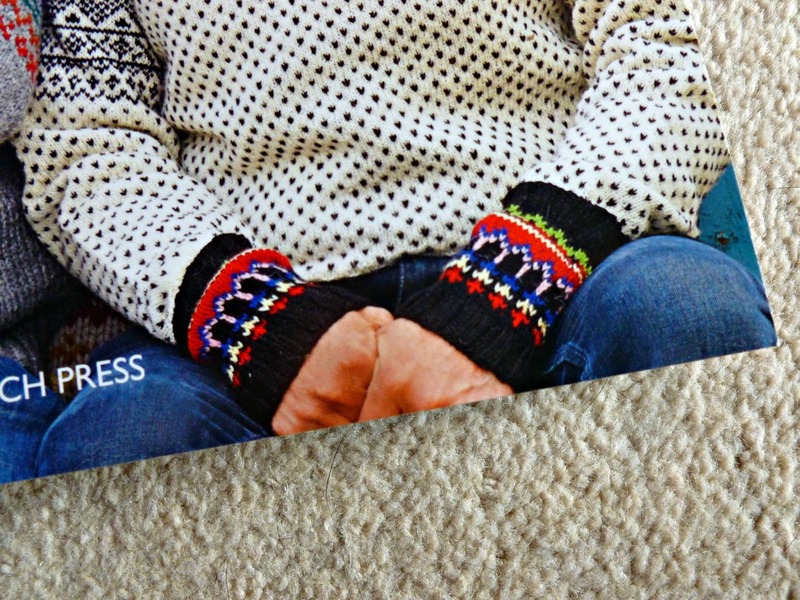 He always knits with 5 DPNs as that's much more common in Scandinavia and Europe than knitting with circulars is. One of the things that I had struggled with whilst trying to get to grips with left-handed knitting was what to do with the yarn in my left hand. When I knit with my usual English flick style, I have the yarn wrapped comfortably around my fingers and this stops it flapping and helps to keep my tension even. 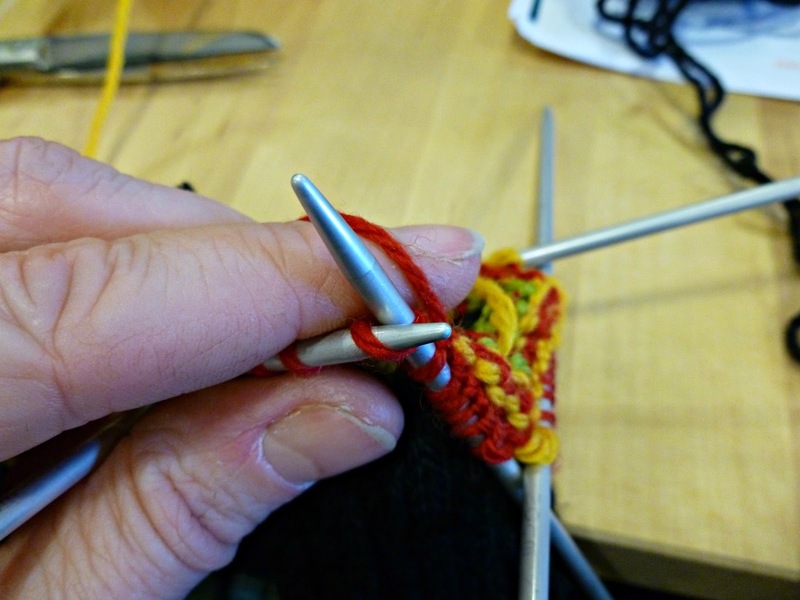 When I've tried to do the same with my left hand, the yarn has become sticky and refused to slide evenly and it's affected my tension in the wrong way. I asked Arne to show me exactly what he did with which hand and with the yarn and at last I do believe I've got it! I've been trying to control the yarn too much and when I just trap it between my first and second fingers so that it doesn't flap about without trying to control the speed that it passes through my fingers, the tension magically sorts itself out. Hooray! And now look at me! I can't tell you how pleased I was with myself to be able to work the colours with both hands and for my tension not to go horribly wrong. It's a bit fiddly being back on DPNs again but it's actually been slightly easier to work on a straight needle rather than a bendy circular whilst I'm learning something new. I didn't finish my wrist warmer in the time we had for the workshop, but that doesn't matter. I feel that I have gained something much more valuable in my new Norwegian knitting skills and I'm looking forward to working on the project in my own time. The pattern that we were using is called Klo, which translates as "bear's claw", although the variations of language have struck again and it is subtitled "5 Wise Virgins". I don't know who the virgins are or what their connection to bears is (I suspect it may have something to do with the Bible story although there are definitely no bears in it) other than that the tall stands could indeed look like the candlesticks of the story rather than claws coming down from the red bear's paw. After a break for lunch, the tables in the workshop room were replaced by seating and more people came in to listen to Arne and Carlos' afternoon lecture. I've been to quite a few university applicant lectures with big daughter recently and if I'm honest, I probably expected Arne and Carlos' talk to be in the same style; interesting, informative but delivered in a way that kept them at arm's length. What I didn't expect at all was to listen a lecture delivered by a design team who work seamlessly together, two parts of the whole, and are clearly very comfortable in their own skin, as we would say in our family. There was a lot of laughter; they talked in a humorous, often self-deprecating way, happy to amiably correct each other during the conversation - because that was what it felt like. We could all have been sitting down at a dinner tble listening to them recount anecdotes from their lives. They talked about their railway station house in the mountains which Arne bought and Carlos visited with a vision in his head of a wonderful house that didn't match up to the reality at first. Their beautiful English cottage garden built on raised beds on the station platform. Translation issues that we have already talked about - clearly it is something that they have grown used to after their first book 55 Christmas Balls to Knit didn't appear with the expected title of "Christmas Baubles" - although they wouldn't have got so many jokes from the word "baubles"! I'm not going to show you every photo from the lecture or tell you everything about it as you may get the chance to go in the future and I wouldn't want to spoil it for you. I must tell you, though, the story of the sock yarn because ... well, because it's me and I must J.
I learnt that the colours of the sock range that Arne and Carlos designed were inspired by the paintings of the Norwegian artist Edvard Munch. My favourite, called Star Night, which is at the top right of this picture is inspired by one of Munch's landscape paintings and the bottom right by one of his self-portraits. However, Munch's most famous painting is The Scream, a vivid orange painting of a distraught-looking man and you can guess which of the sock designs was inspired by that one! Unfortunately, the yarn manufacturers were less than enamoured at the thought of one of their yarns being called "Scream" so it was re-named as the rather less contraversial "Twilight". A later yarn based on one of Munch's paintings called Vampire also found itself being renamed. I can't think why ...! 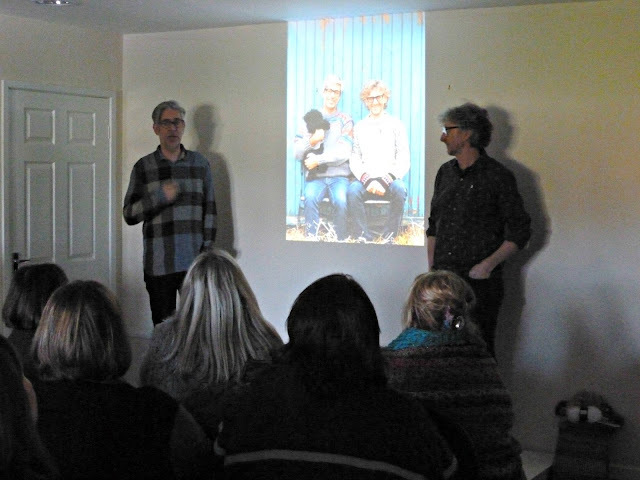 It was fascinating to hear about the memories and objects that have shaped Arne and Carlos' career. 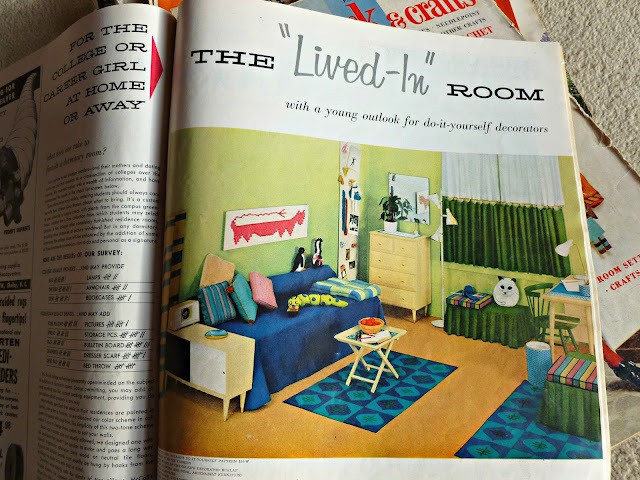 They clearly have a veritable library of memorabilia in their attic which they are able to draw upon for inspiration (I like to think that our attic is like that although I suspect that ours is considerably more disorganised than theirs is - another place that I have plans for this year!). Arne's family has lived in Norway for generations whilst Carlos has lived in a variety of countries and speaks several languages, and it is the merging of the traditional and the modern, settled and far-flung that has shaped their design style today. After the lecture, there was time for photographs and book-signing; there was no question of people being rushed out before they had had chance to chat and pose for the camera. Preconceptions of celebrities who are too busy to spend time with the people who come to meet them just don't apply here; instead there is patience and generosity and I was both highly impressed and grateful for that. It was a great privilege to be able to spend so much time with Arne and Carlos and listening to their stories has just deepened my interest in their part of the world. Northern - and Norwegian - inspiration indeed! 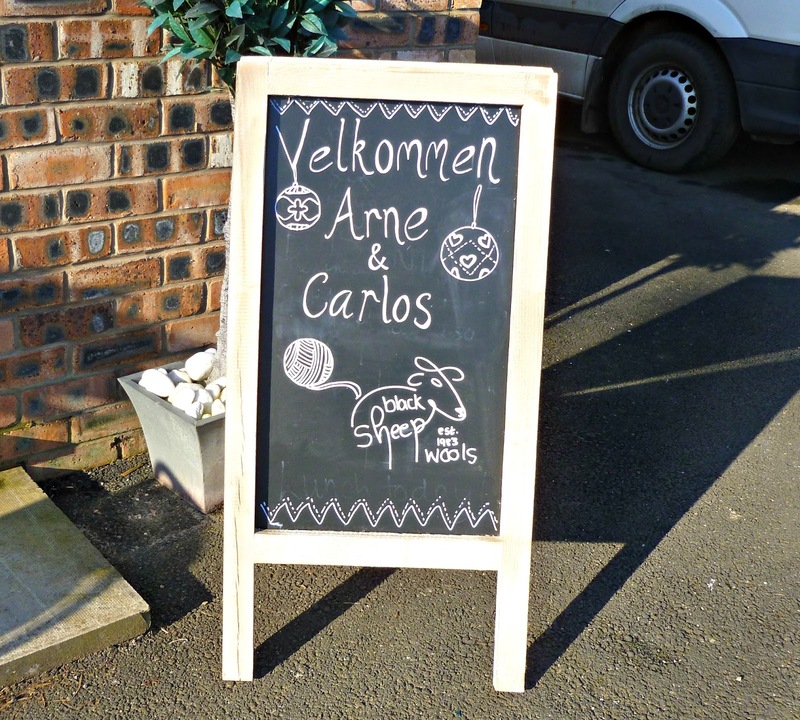 Huge thanks to Sara and Black Sheeps Wools for the invitation to dinner and the workshop, and to Arne and Carlos for sharing their evening with a Mum from Winwick. I was supposed to be spending today outside, clearing up the garden, cutting back, shredding and generally having a nice time getting ready for spring. And then the weather happened. 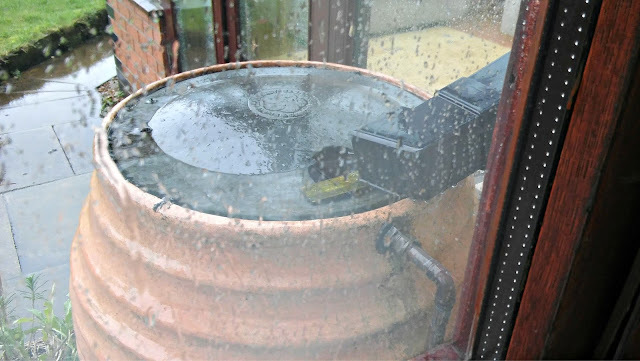 I watched rather dismally as the rain swept in across the fields and fell faster than the overflow on the rain barrel could cope with the water. I told myself that somehow, without looking, I'd turned into a fairweather gardener and I should just go and put my wellies on and get on with it. I opened the door and even the dog slunk back to his bed by the Aga. I decided that I could better use my time inside where it was warm and dry. Instead of gardening, I've spent a long time today catching up on admin-type things on the computer that I've been putting off for an even longer time. Things that needed putting onto eBay, things that needed ordering, emails that were long overdue. I've actually ticked quite a lot off the list and although I do still keep asking myself if I could manage to just go out for a little bit, one look at the rain running down the windows has persuaded me to stay in and find a few more admin-type jobs. And if I get up now, the cat on my lap will get cold. 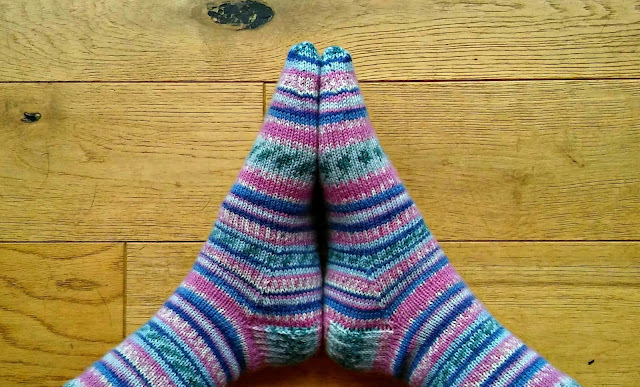 I finished my Arne and Carlos socks off this morning. I had a bit of trouble getting these to match so they've taken me longer than I expected; all down to me being a perfectionist (some would use a less polite word) as I wanted the stripes to match exactly, not be just close enough. I can still see one or two places where I'd like them to be different, but even I have to accept that sometimes life is too short and instead I will just love them as they are. And I do. I really love them. It's been a while since a colour combination gripped me quite like these ones (the other one that does it for me in a similar way is the Regia Design Line Delphinium yarn that my basic sock pattern is knitted in) and I know that I will want to wear these as often and as quickly as I can get them through the washing machine and back into my sock drawer. I've done a bit of tidying up too, and a few loads of laundry (isn't it funny how as soon as you empty the laundry basket, it's full again?) which have had to go through the dryer. I'm looking forward to being able to get my washing out on the line again, but I don't think that's going to be any time soon. 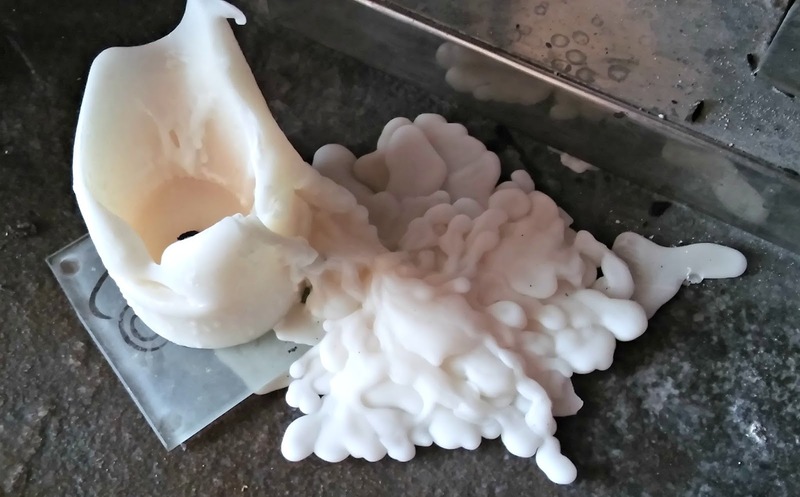 I should probably clear this candle up but I like the way that it's spilled out on to the hearth (luckily we have huge varnished slabs which don't mind a bit of candle wax at all). It makes me think of lava or perhaps a glacier (to continue my northern theme). The candle smelt wonderful and it's a shame that it's now reduced to this puddle, but I have enjoyed it. I might try re-melting it and putting it in a pot with a new wick to see if I can give a bit of an extra life. The hours have ticked on and the rain is still falling. I've decided that it's perfectly acceptable to do a bit more knitting. 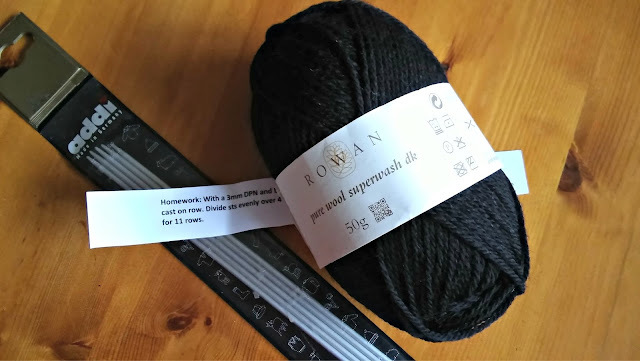 This is my homework preparation for the Arne and Carlos workshop at Black Sheep Wools next week: I need to knit the rib for the wrist warmers that we're making. It's a good idea - rib can take such a long time and we've only got the morning to get to grips with the colourwork and the pattern. 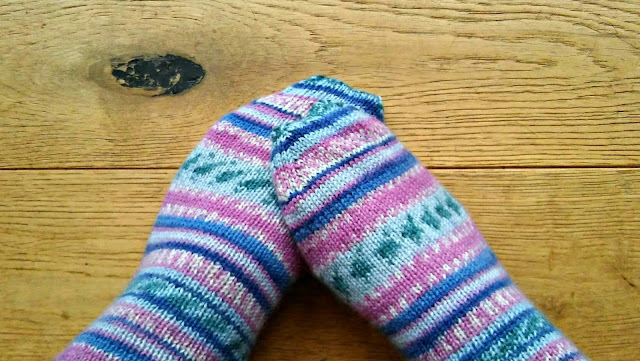 It feels funny knitting with DK yarn - I've not used it for such a long time as my socks are all made with 4ply! 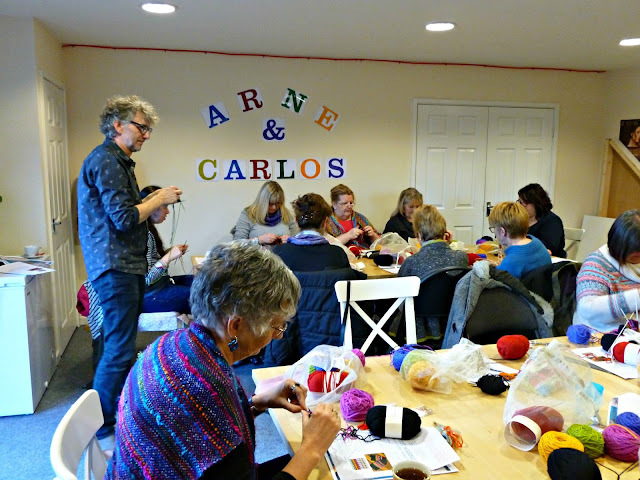 I'm really looking forward to the workshop, I love learning about new things and although I've done colourwork before, I'm interested to see how Arne and Carlos do it. 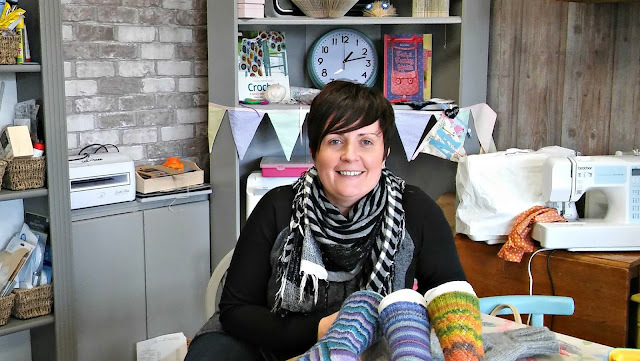 In particular, I'm fascinated by the idea that you can hold yarns in both hands so that you flick from one colour to the other without having to let go. It has that "why didn't I know about this years ago?" 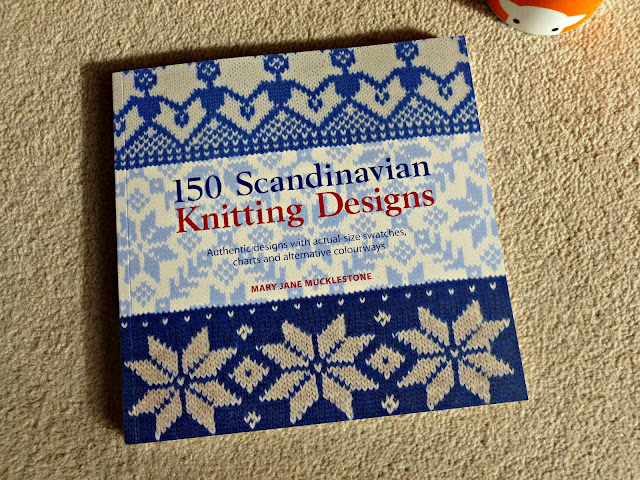 feel about it (and it would have been very useful as I used to knit Kaffe Fasset colourwork jumpers for the yarn shop in the village where I grew up) but I know about it now and it's never too late to learn new things. Talking of which - I've still not quite finished my FutureLearn course on the Orion constellation, but I will do. We've had a few clearly and frosty nights over the past week and the stars have been bright in the sky; it's been easy to pick out Orion's belt. I don't know what it is about that row of stars but wherever we are in the world I always look for it and it makes me feel at home. It reminds me that we're all connected, no matter where we live. I know a few of you signed up for courses yourselves - how did you get on? It'll be time to make dinner soon, but I think first of all is a trip into the black hole that is small daughter's bedroom. She's growing so fast that she's outgrown quite a few of her clothes and we need to sort through them to see what fits and what doesn't. I've been threatening to do this for weeks but have been easily distracted by other things ... I love the results of de-cluttering, I'm just not that keen on doing it! Hope you manage to stay warm and dry today, whatever you are doing! And on Monday 7 March 2016 you can do just that! The workshop room at my local yarn shop, Black Sheep Wools Craft Barn in Culcheth, Warrington, is booked for another Sockalong Knit n Natter afternoon. We're going to meet from 1pm-3pm, everyone's welcome, it's free, and you can bring along any project, it doesn't have to be socks! There's a lovely cafe at Black Sheep where you can treat yourself to a slice of their fabulous cake (or even lunch if you're early! ), and if someone has given you a lift there is plenty of space and even a comfy sofa for them to wait for you with a newspaper. You can find information on and directions to the Craft Barn here. The nearest train stations are Birchwood and Newton-le-Willows but will involve a taxi-ride to Black Sheep; alternatively the number 19 bus from Warrington town centre will stop close to Glaziers Lane so the Warrington stations might be a better option for public transport if going to travel by train. If you were to ask me about my favourite period in history, it is without question the Romans. It always has been, and I am fascinated by the extent of the Roman Empire and love to see what remains of it even today, and even in the most remote and sometimes unexpected places. However, if you were to ask me about my favourite parts of the world, then although I do love Italy and the Mediterranean areas, I am always drawn north. Yorkshire, the Lake District and further north to Scotland. On my list of places to visit are the Scottish islands and further north still to Scandinavia and Iceland. I recently finished reading The Year of Living Danishly by Helen Russell which was in my pile of books to read and I thoroughly enjoyed it. 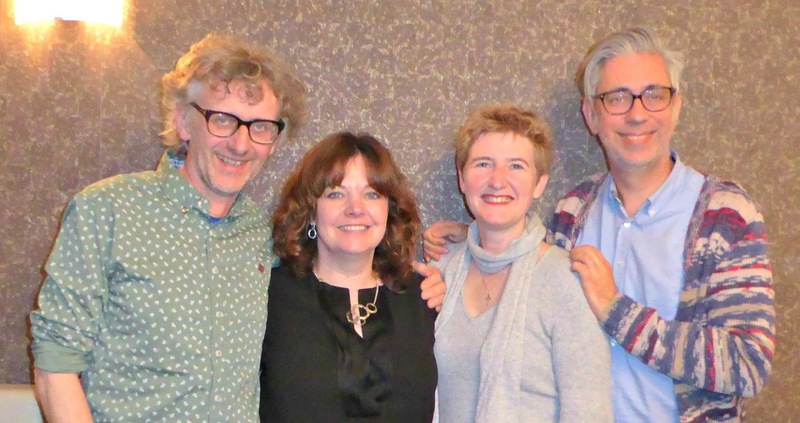 There's even talk in the Perry household of Scandinavian city-breaks this year which is very exciting! When I came to put the book back on the bookshelf, I noticed just how many books I had with a northern flavour, and decided to sit down in the sunshine for an hour this morning to take another look at them all. I've had these two for such a long time. 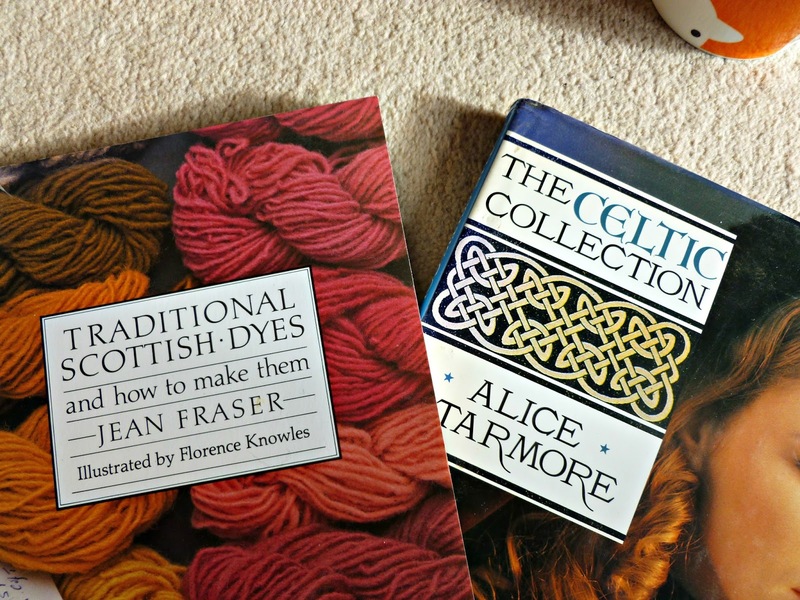 One day I really will have a go at dyeing my own yarn and although I've never taken the plunge, I've loved looking at the recipes in this book. I'm not going to tell you how long ago I bought it and have still never got round to dyeing any yarn! I've had the Alice Starmore book for a long time too. This book was a Christmas present many years ago, and I chose it particularly because it is full of Celtic cables and patterns inspired by carvings on stones found in Scotland and Ireland. I think the thing that does it for me with these types of patterns is that many of them never actually end; you could keep tracing them around for hours without finding a finish point, and the thought of being able to recreate that in yarn seems quite magical. 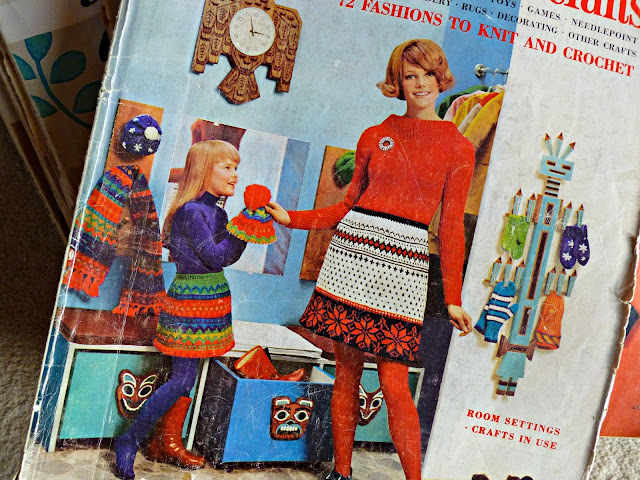 However, I think it was these books that really sparked my love of northern-influenced crafting at an early age. 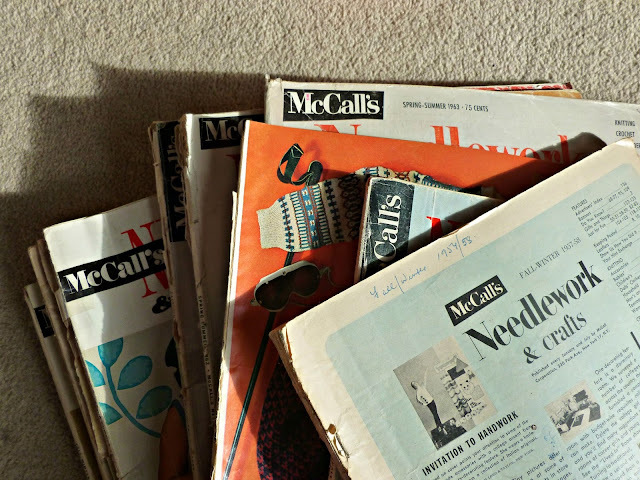 These are McCall's Needlework and Craft books which I think originally belonged to my Grandma and were sent to her for years by my Canadian relatives. They are a mixture of patterns, pictures of crafts that require a pattern to be sent for, and adverts for all kinds of craft kits and career opportunities. 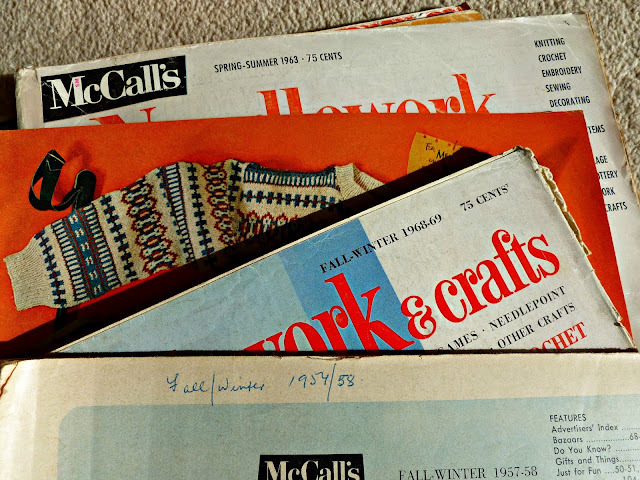 When I was young, I would spend hours poring over them looking for inspiration for things I could make or adapt from the pictures as sending off to America for the patterns wasn't an option. As you can see, some of them are really quite old, and even by the time I started reading them in the 1970s they were quite dated. It didn't stop me wishing for a bedroom like this one, though - I don't know how well you can see in the picture but it's "for the college or career girl at home or away". To my junior school self, that seemed very glamorous! A bed that turned into a sofa? The height of sophistication! 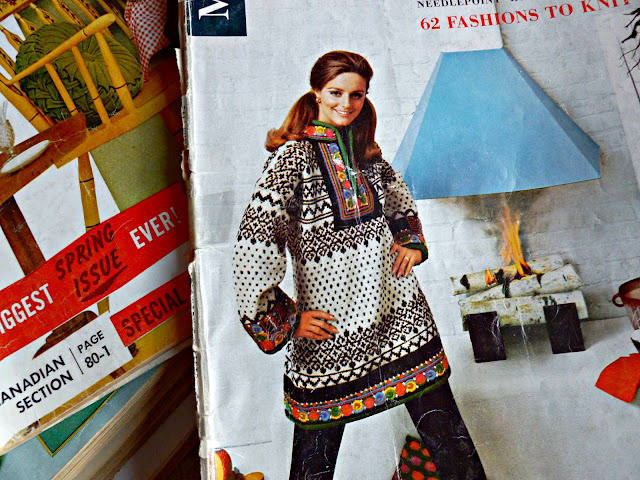 and this tunic. Isn't that fabulous? I really wanted to wear this but a) I was too small at the time and b) it wasn't the kind of thing that you wore around our village in the 1970s. I fell in love with the colours around the cuffs, the placket and the hem; there's something about that rainbow teamed with the black and white patterns that really shouts out to me! 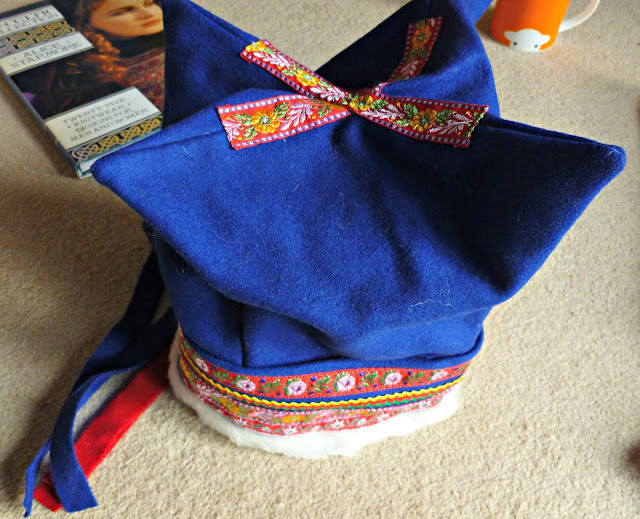 I was reminded of the braiding on the Four Winds hat that we brought back from Finnish Lapland when we visited one winter. I don't know what it is about the far north that pulls me quite a strongly as it does. The snow, obviously - I've always wanted to live somewhere where there are "proper" winters with snow deep enough to cover the tops of your wellies. 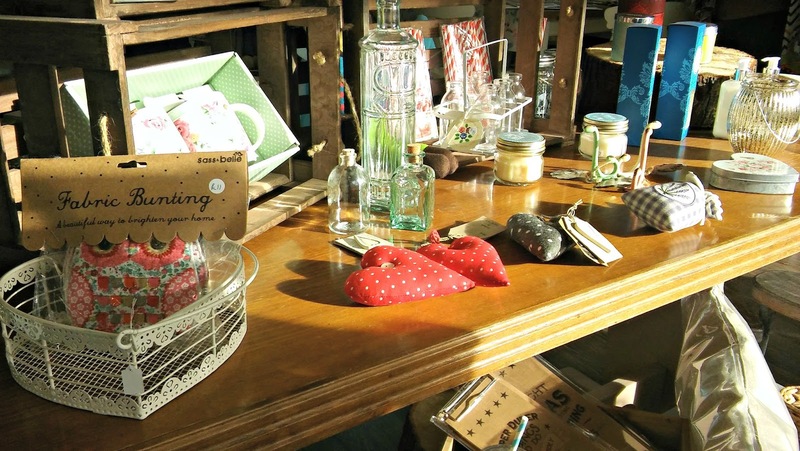 Long winter nights snuggled up with blankets in front of roaring fires, knitting in hand and a hot drink close by. The Aurora Borealis or Northern Lights - oh, how I love those colours! In Finland, it's called Revontulet after a Sami legend of a running fox's tail striking the snow to send sparks into the sky and I love that too. It suits my imagination much better than the real reason for the Aurora of solar flares! The idea of hygge, a Danish word which I read about in Helen Russell's book which roughly translates as "cosiness" and sounds perfect to me. Tales of Vikings, trolls and hardy souls who lived their lives in far from hospitable conditions. 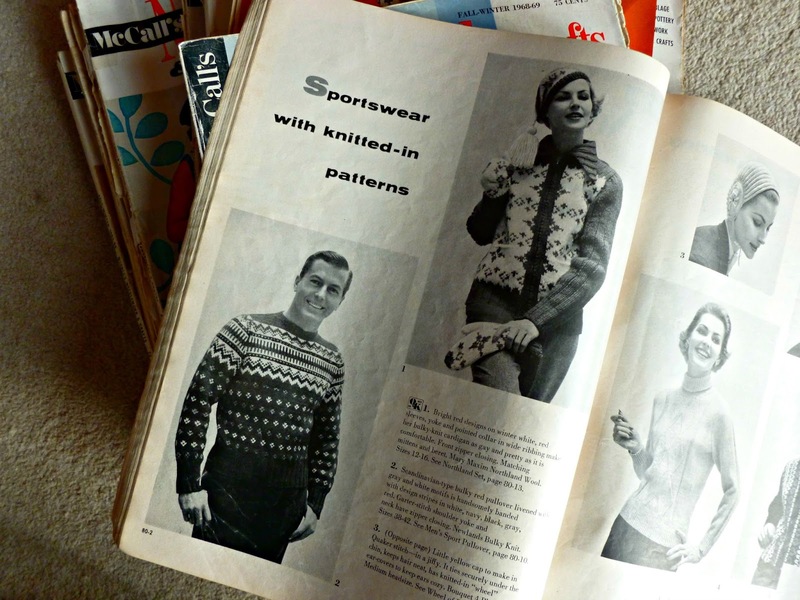 I suspect I have a very romantic view of it all and that real life is very different, but it doesn't stop me enjoying the regular geometry of the knitting patterns and the comfort of warm woolly clothing. It seems that some things don't really change. Looking through this book which I treated myself to the other week, I saw patterns which reminded me of the 1950s and 60s patterns in the McCalls books. 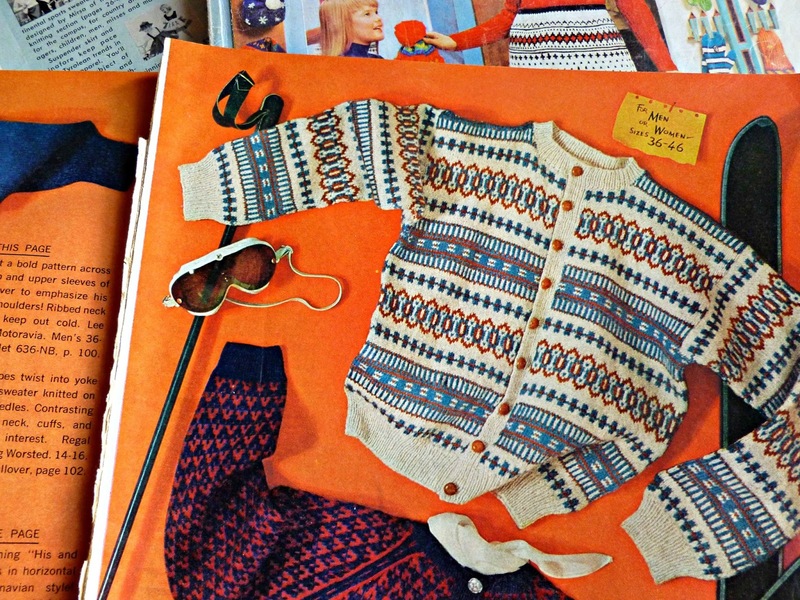 Perhaps I am not the only one who likes the idea of hunkering down in cosy hibernation with a good excuse to sit and knit! And these books too, are inspired by traditional designs. It made me think again about the combination of new and old, which I wrote about in this month's Monthly Musing. Arne and Carlos are holding a workshop and lecture at Black Sheep Wools in a week or so's time which I'm lucky enough to be going to, and I'm very much looking forward to meeting them and hearing about their inspirations. I'll be sure to tell you all about it! My Arne and Carlos socks are coming along nicely - they've been a joy to knit with the Scandinavian-style patterns appearing magically out of the ball and onto my socks. I really love these colours, I can't wait to be able to put the socks on! 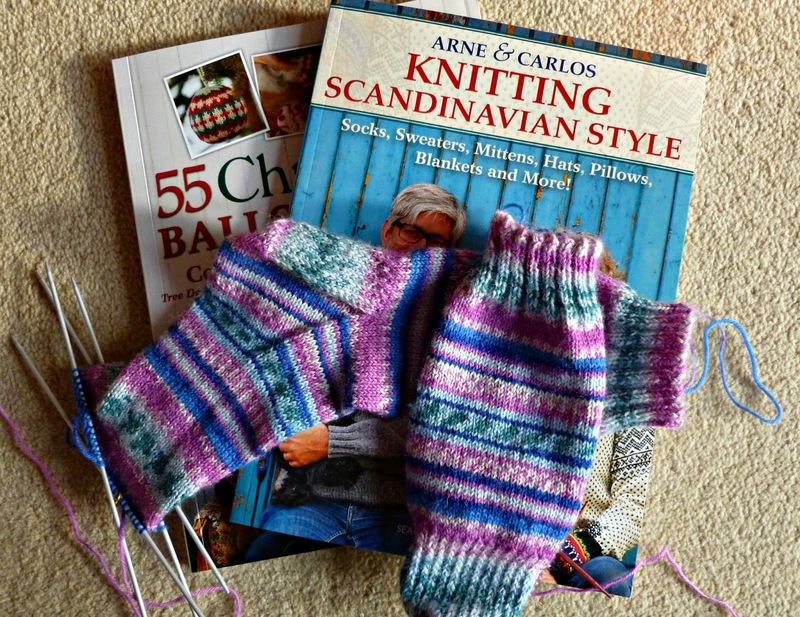 I might even have them finished in time for the workshop but I'm not sure that waving my socks at Arne and Carlos would be very appropriate, even if my feet weren't in them at the time! 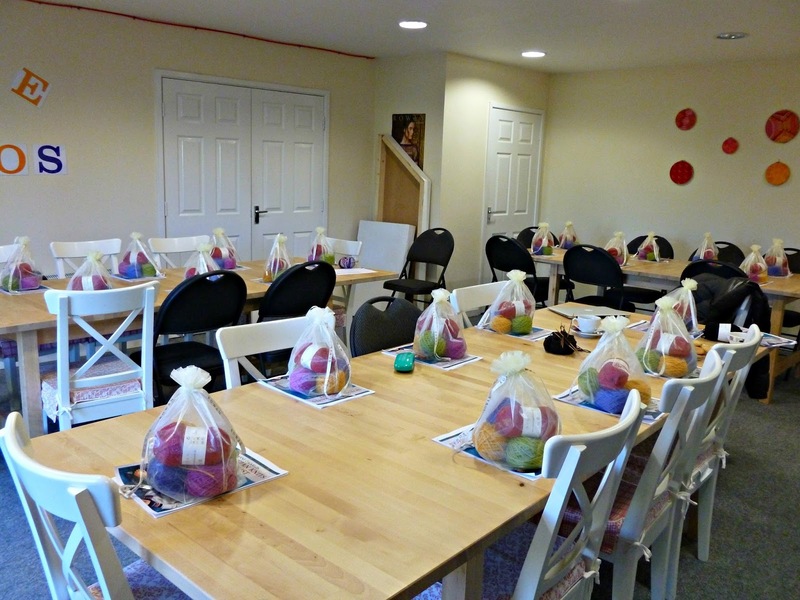 We're going to be knitting wrist warmers - these ones here that you can see in the bottom of the picture. 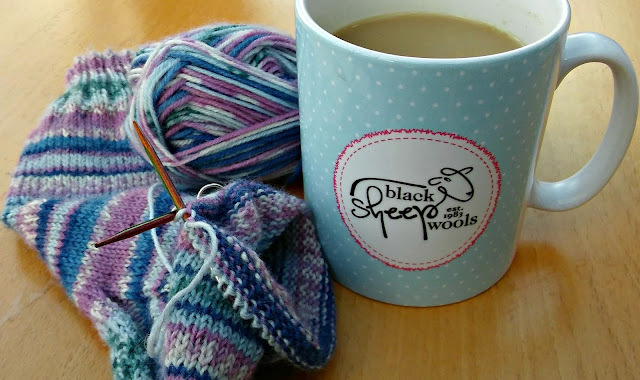 It'll be a good opportunity for me to practice colour work holding the yarns in both hands which is something that I've never tried before - I'm hoping it won't seem too fiddly now that I've practiced Continental knitting! I've never owned a pair of wrist warmers before (I might have mentioned that I'm a mitten kind of girl!) so they'll be an interesting addition to my wardrobe! 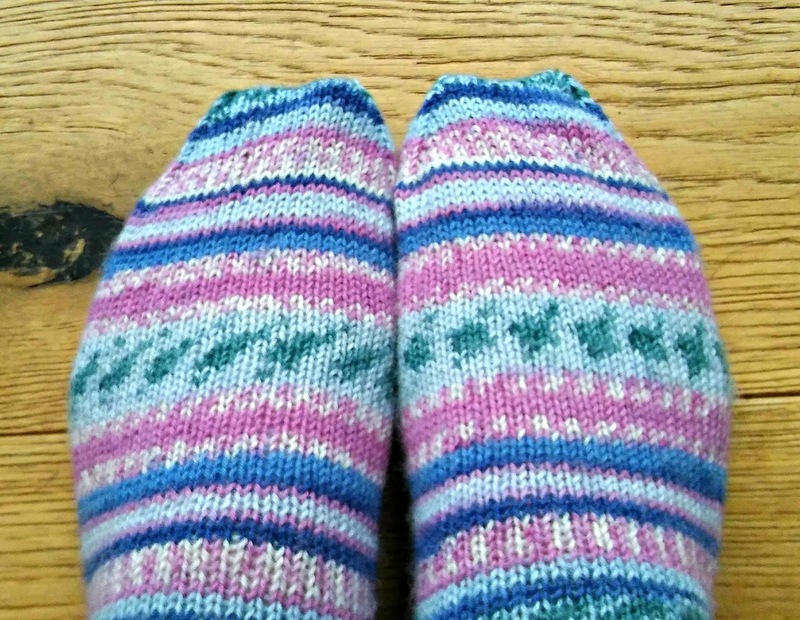 And I'm already thinking about socks with Scandinavian motifs ... I'd better get those socks finished! 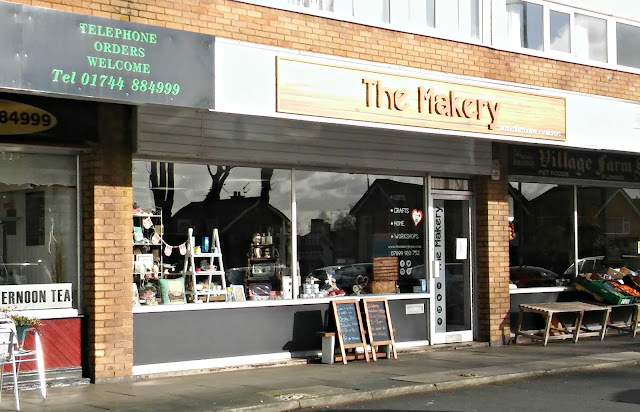 A couple of weekends ago I spent the morning at The Makery in Rainford, near to St Helens. The weeks have flashed past and I haven't had time to tell you about it so let me show you my photographs now. It's a lovely place, tucked away in a parade of shops along one of Rainford's main streets. 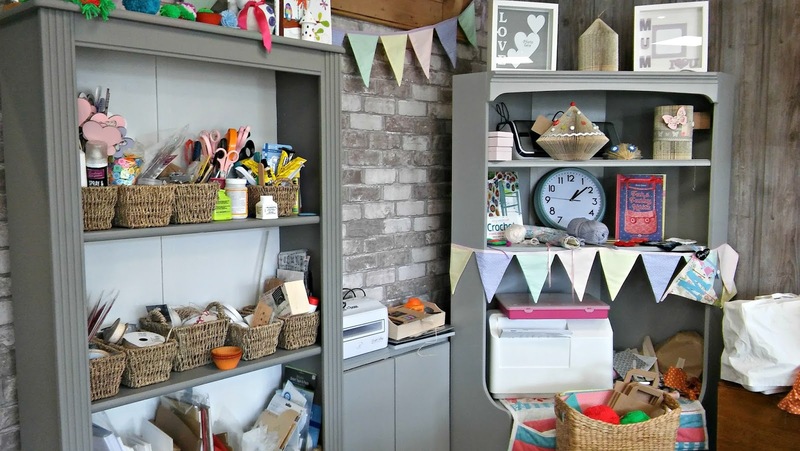 Just the kind of shop that you'd like to find in your village, where you can buy special gifts and learn new skills as easily as buying a loaf of bread or a newspaper. And this is Catherine, who owns the shop. 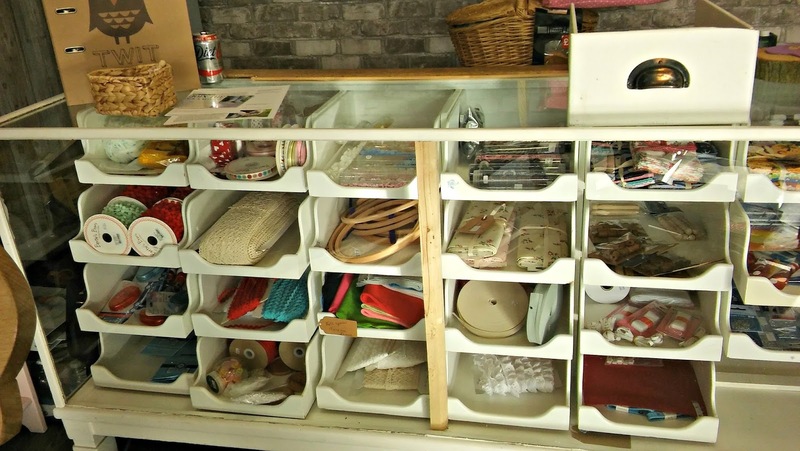 She's lovely too, friendly and welcoming, and doing what so many of us would like to do for a living by owning a craft shop. She has a good eye for what people like, and her shop is filled with all kinds of treats - some to buy and some to make. Catherine runs regular workshops on sewing, crocheting and lots of other crafts - you can find out more here on her Facebook page. She even teaches people to turn old books into unique ornaments by folding the pages in clever ways which seems like some kind of magic to me! Whatever your craft, I'm pretty certain you'd find supplies here. 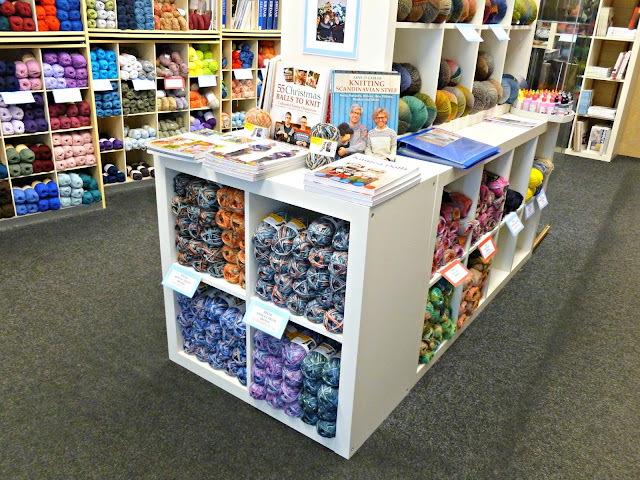 From yarn for knitting and crocheting to buttons and material to card-making resources, it's all here! 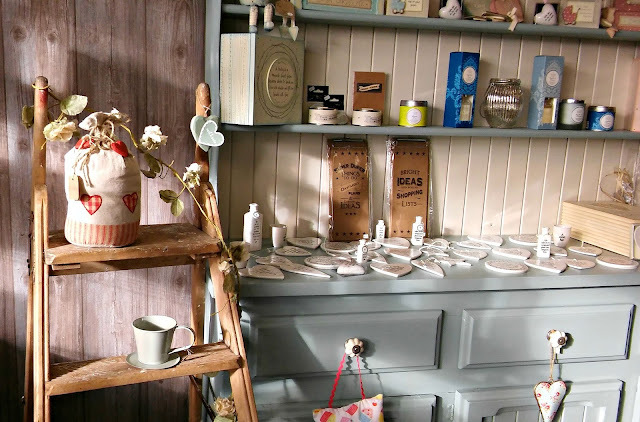 I could have spent a very long time poring over every item; there's so much to see and I know that I would have loved a shop like this in my village when I was growing up. I always had something creative on the go and this would have fed my habit nicely! One of Catherine's specialties is re-painting old wooden furniture and she has a good range of paints for the job. 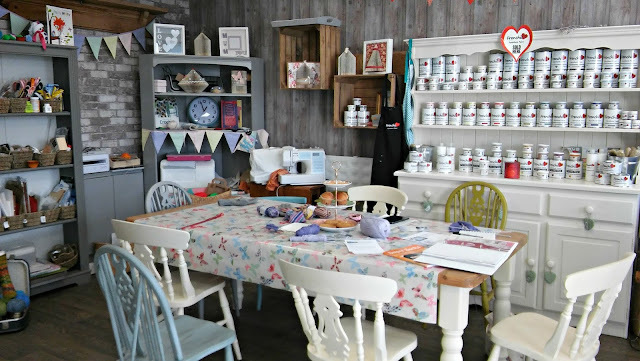 I love shops like this, they make me itch to try out new skills! 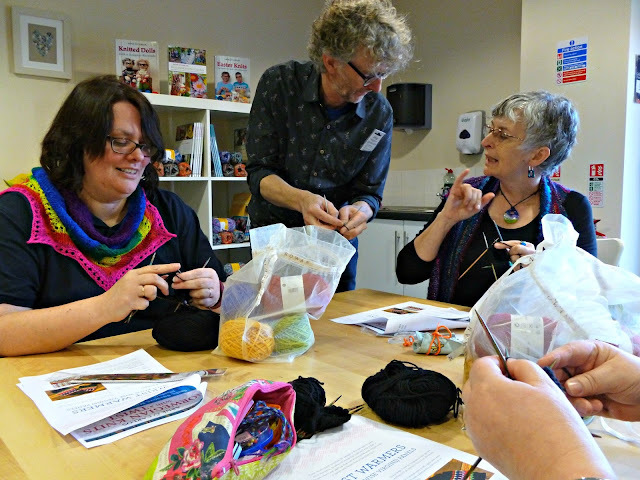 On this particular Saturday, a certain sock knitter was visiting for a sock clinic and drop-in knit n natter session. 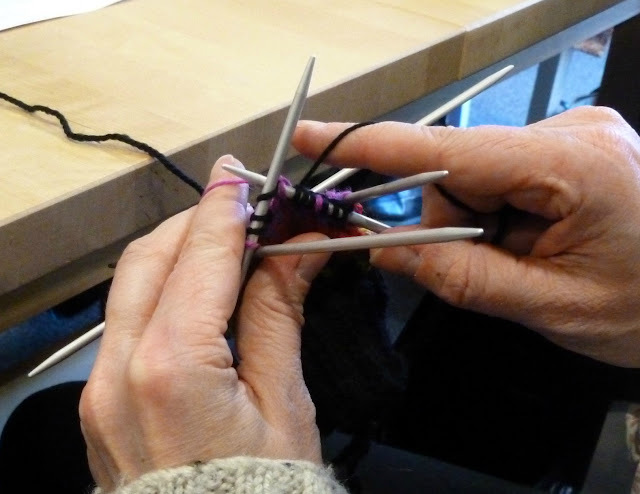 It was lovely to meet new people who were able to try out the various sock needles and stay to chat for a while. Knitting and nattering is such a sociable activity! The workshops all take place around this table too; small groups who have the chance to get to know each other as well as what they are learning. 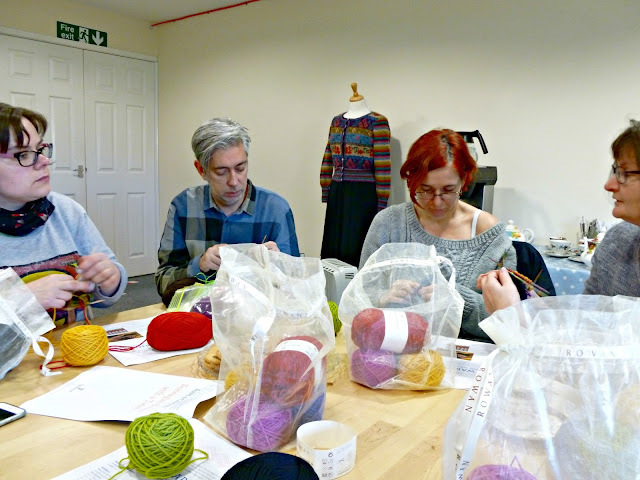 Why not make new friends at the same time as honing new skills? It sounds perfect to me! I've written before about how important I think it is that shops like this one should be supported by the local community so that they - and the community - can thrive. How wonderful to have an oasis of crafting calm in the centre of a busy village! It's something that every village should have, in my opinion, and aside from it being someone's dream and all dreams should have the opportunity to flourish, I feel that if we don't support our local businesses, we all become the poorer for it. We will be left with generic superstores that offer us what they think we should want, without any room for individual taste or desires. That would be a very sad day. There's a knit n natter group here every week (and you don't get many of those in your local supermarket!) 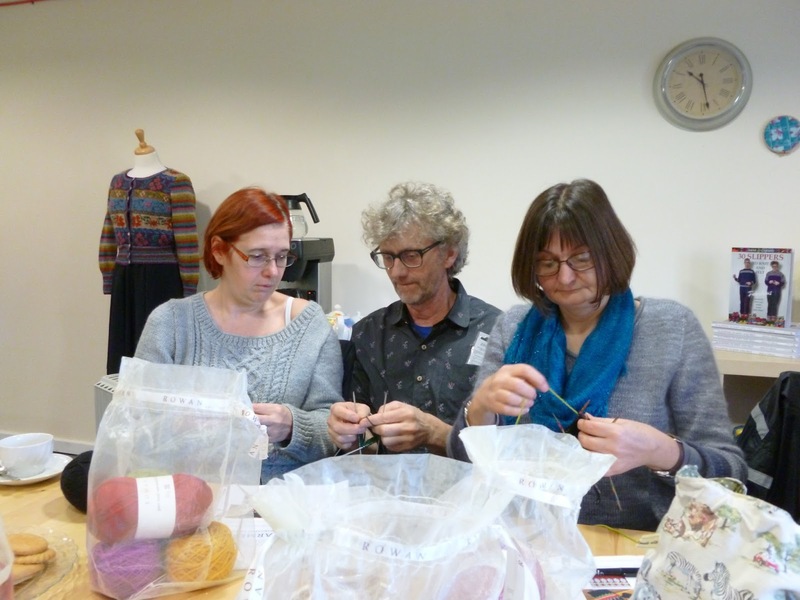 and some of the workshops run in the evenings too, so that there's as much opportunity for people to attend as possible. 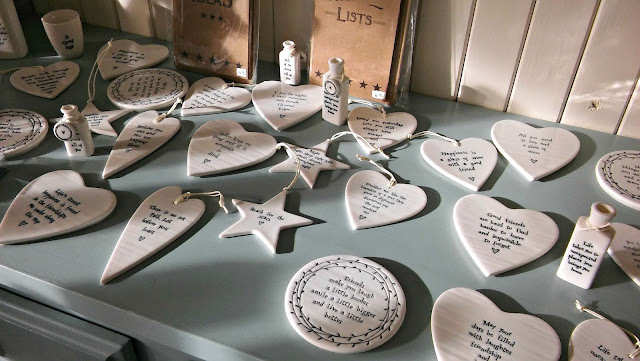 Catherine even holds children's parties - children love having a go at all types of crafts and where will our designers and crafters of the future come from if we don't teach them from a young age? 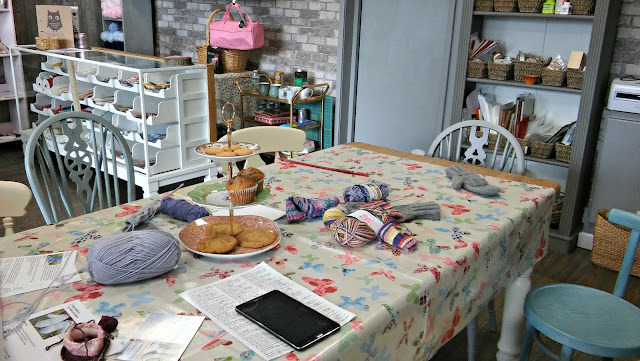 I thoroughly enjoyed my morning at The Makery and will be back later in the year to run a sock-making workshop which I'm very much looking forward to. 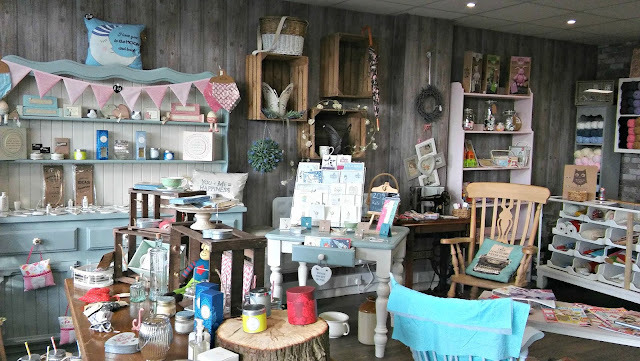 If you live close enough, I can definitely recommend popping in to visit - you'll be glad you did!